Andrew Daniels had a hunch there was some connection between his graduate studies in conflict transformation at Eastern Mennonite University and the sport he’d loved for most of his life. But it wasn’t until his second season coaching a high school basketball team in the Shenandoah Valley of Virginia that he saw, very clearly, the need for applied conflict transformation in the athletics context. Andrew Daniels (back row, right) with athletes in one of PeacePlayers international programs. In the midst of the heated 2016 presidential campaign season, politically-derived tensions naturally entered into the school environment and trickled down into team dynamics, challenging the boys’ ability to work together. “Some boys supported one candidate in pretty vocal ways and their language, as well as that from other students, made teammates feel like they were being targeted,” Daniels said. Thinking through possible approaches, he realized that structured dialogue in a calm and supportive environment could potentially help mediate the situation. That nexus between peacebuilding and sports led Daniels to pursue professional work in the field upon graduation from the Center for Justice and Peacebuilding in 2016. Sport for development, modeled on the ideals of the Olympic Movement, uses athletics participation as a means of enabling cooperation and peacebuilding among both children and adults. The approach has staunch believers and some dissenters around the globe. 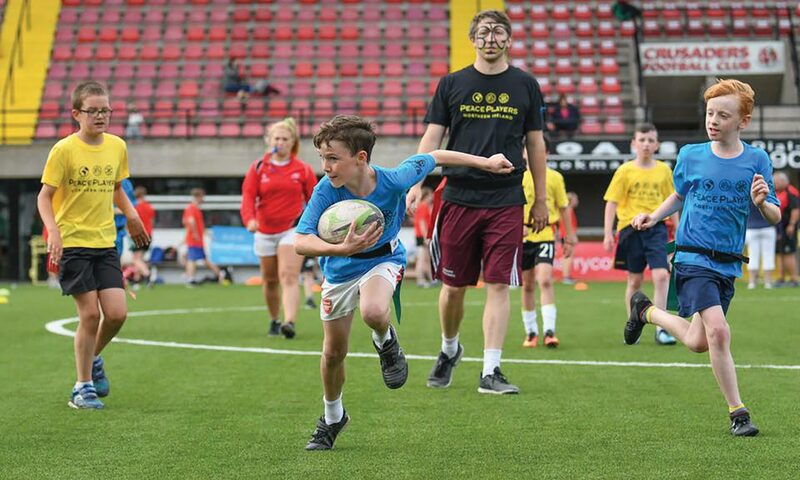 Daniels is now an international fellow with the Belfast-based program of PeacePlayers, which combines sports programming with peace education and leadership development for youth in communities in conflict. 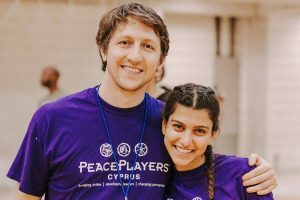 PeacePlayers also has programs in Cyprus, the Middle East, South Africa, and the United States. As a project coordinator in South Belfast, Daniels oversees programs for youth ages 7-18 with the aim of bringing together residents of starkly segregated neighborhoods. Ninety percent of public housing is divided along sectarian lines, and only 7 percent of pupils attend integrated schools, according to PeacePlayers research. 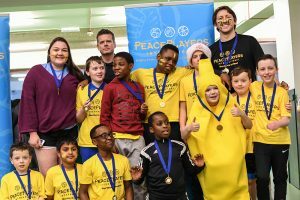 PeacePlayers brings kids from different religions together in Northern Ireland to play sports and learn conflict resolution skills. In a “twinning” program for the youngest residents, a Catholic and Protestant school pair up for 12 weeks. Daniels and a team of coaches conduct introductory sessions at the separate schools during the first week. Over the next two weeks, each student group visits its partner school for a welcoming ceremony and tour. “They see a lot of similarities, of course, with their own schools, which helps to set the stage for relationship-building,” Daniels said. The following weekly sessions of about two hours are hosted at a neutral site. 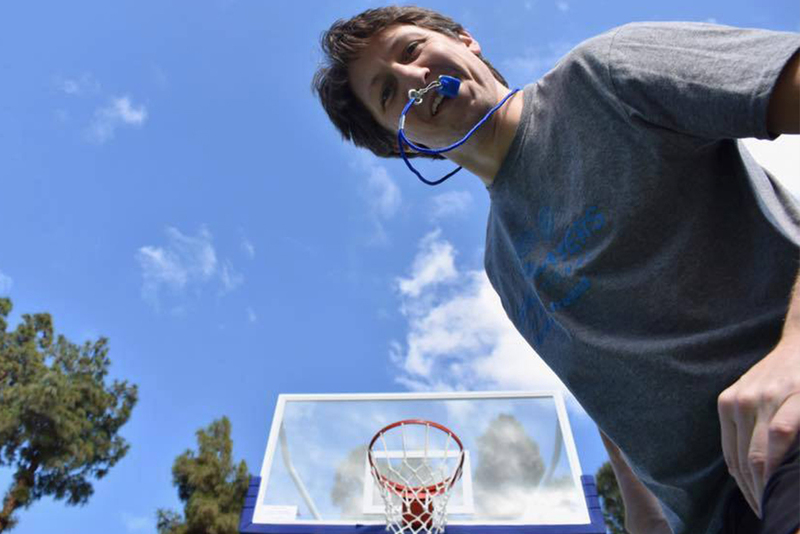 A rigorous set of “mixer” exercises helps to break down barriers and create integrated teams, which then rotate through 30-minute sessions devoted alternately to basketball skills that demand teamwork and communication and peace education curriculum about topics such as stereotypes, peer influence, symbolism, prejudice and discrimination. PeacePlayers has programs in Northern Ireland, Cyprus, the Middle East, South Africa and the United States. Daniels said the change from the first meeting, “when the Catholic kids are on one side of the circle and the Protestant kids are on the other side, just looking at each other,” to the final meeting is “amazing.” The bonding exercises nudge students together, but it’s the willingness of the children to overcome stereotypes and prejudice that Daniels finds inspiring. Daniels also works with Champions 4 Peace, a leadership program offered by invitation to youth ages 14-18 who have been through the twinning program, as well as Belfast Interface League, an evening and after-school program that offers opportunities to play basketball and explore peace education at more advanced levels. In the gym and in the classroom these last 10 months, Daniels still finds the experience of living and working in Ireland “surreal.” He is walking in the footsteps of one of his heroes: His grandfather, now living in Daniels’ hometown of Roanoke, Virginia, is a Belfast native who immigrated to the United States in the ‘50s. Along with a dream of peace for Belfast, he has one more, he said: a walk through the city with his grandfather.